When making homemade brined pickles, there seems to be many people that struggle with the process, usually resulting in soggy pickles that are not crunchy at all. Some swear by adding grape leaves to retain a good crunch and others add whey to speed up the lacto-fermentation process. This age old practice is a simple, salt brine cure set out at room temperature for days, weeks, or even months. The process of fermentation creates an ideal condition for the lactic acid-forming bacteria existing on the food surface to feed upon the sugar naturally present in the food. The lactic acid will continue to grow (or ferment) until enough has formed to kill any bacteria present that would otherwise cause the food to spoil. The end result is a product filled with lactobacilli which produces numerous helpful enzymes as well as antibiotic and anti-carcinogenic substances. As far as flavor, the salt brine naturally sours the pickles and gives them a fantastic crunch. During the summer when the farmers markets are exploding with fresh vegetables, I like to naturally ferment many different varieties of pickles. I pickle whatever I have on hand, but generally my families favorites are asparagus, green beans with radishes, pickles, beets, cabbage, and cayenne peppers for hot sauce. What I especially love about natural salt brine cures, or fermented pickles, is that they are easy to make and work well in small batches. It’s easy to fall into a mentality that we need a large quantity of fruit or vegetables to put up at one time. For me, it’s so much easier and relaxing to put up a small amount of jars weekly. By the end of the summer I usually have a fridge filled with fermented vegetables that we eat into the winter. I’ve been using this same pickle recipe for the past few years. It’s very simple and relies on salt. I don’t like to use whey in my ferments as I’ve found if you add enough salt and allow the pickle to ferment for at least two weeks up to two months, the end result is sensational. Now that Big Brother is 7, he’s become our home pickle master which has been a tremendous help to me. I love this getting older bit! Homemade pickled cucumbers are a cinch to make and doesn’t take long to prepare at all. My number one secret to a crunchy pickle is to use freshly picked cucumbers from the farmers market or picked from your own backyard. The fresher the crunchier! I always make my pickles as soon as I get home from the market. I don’t like to let them sit in the fridge for a few days as I feel this will impact that crunch factor. Fresh is best. After I get the cucs home, Big Brother and I give them a good scrubbing to remove any dirt particles and flower ends. We then layer up the bottom half of a quart sized mason jar with the larger cucumbers. Big Brother then cuts the ends of two cloves of garlic and gives them a good smash with the back of his knife. Into the mason jar we add the garlic, 2 bay leaves, and just about a tablespoon of pickling spice. We then top the jar with as many more cucs as we can fit and add fresh dill. I then fill the jar with a salt brine and allow them to ferment for two weeks. I like to burp the jar after a week. Burping a jar means opening the lid and allowing the gasses produced from the fermenting vegetables to escape. You can taste a pickle at this time to see if it suits your taste buds. Be aware that after two weeks, the water gets cloudy. This is completely normal. The end result is a pickle that tastes as it did in days past. Naturally sour, a bit fizzy, and crunchy. To see what the fizz of fermentation looks like, check out my video here. These pickles definitely taste different than a vinegar pickle, but I absolutely love them this way and I’m sure you will to. Properly clean 3 quart sized mason jars. To each quart sized mason jar, stack the bottom with as many cucumbers as you can fit. Add a good amount of dill to each jar, then fill each jar with as many more cucumbers as you can fit. Do not allow the cucumbers to go up into the band area. Make sure there's 1" headspace between the top of the jar and the lid. On the stovetop, heat 1 quart of filtered water with 6 tbls of salt until it dissolves. Once the salt dissolves into the water, remove from heat. Add 1 1/3 cups of the salt solution brine to each jar. Do you enjoy making naturally fermented pickles? Please share with me your favorite vegetables to ferment. « Our Year in Homeschool – We Kissed 1st Grade Good-Bye! I am definitely going to be trying this recipe after getting home from my CSA on Thursday! These look so good and easy to make! Wonderful, Laura! Let me know how it turns out for you! Hi Diana, question a few pieces of the garlic turned green/blue. Did I do something wrong? This didn’t happen the first time. Also the brine is cloudy as expected but it also seems to separate…meaning more cloudy and particles towards the bottom. This didn’t happen on my first try so just wondering what I could have done differently. Thanks!! Dee, welcome to the world of fermentation. Every batch is different, lol! I wouldn’t worry about the cloudiness in the brine. It should be totally fine. I worry when I see distinct mold growing on top of any batch of fermented vegetables that I make. If it’s white in the brine, it’s normal. As far as teh garlic turning green/blue, I wonder how old that garlic was. When garlic sits for some time, it can start to turn green within the clove as it begins to re-grow. I honestly wouldn’t worry. Maybe just toss the garlic. Garlic naturally turns blue, when pickled. I learned this in a canning group, no need to worry! I will be trying this recipe tonight, ty! Thanks so much for all these wonderful directions. I have pickled some cucumbers for 2 weeks and then refrigerated them. They are in 1/2 gallon jars and I used small glass jars to push them down into the liquid. If I open them to take out the little jars, does that get the clock ticking faster (i.e. once the jar has been opened) ? I mean, will they last longer in the frig if I wait to open them later when they are to be eaten? I made 4 jars, i.e. 1/2 gallon size, so it might take a few months to get through them all. I would also suggest that perhaps there was iodine in the salt. That could lead to blueing of the garlic. I found using garlic from china is when the garlic turns blue try to buy local garlic!!! I read that using table salt – or anything other than pickling or kosher salt will turn the garlic green or blue. It happened to me the first time I made pickles and I think that’s what I read about it, although it could have been something else. That makes a lot of sense since it has iodine in it. I use salt without so I don’t run into that problem. Yes, me too. I believe it is actually a reaction with the Aluminum. Yes, Aluminum, ugh! Most if not all salt that is “fortified” with iodine is also infused with some nasty stuff. They pull all of the good trace minerals out to sell to the supplement market, put some iodine back in then add a bunch of other yuckies. ” Ferrocyanide, talc, and silica aluminate are commonly included”. Quote from source below. Stick to an unprocessed sea or Himalayan salt for greatest health benefits and better results with your pickles, IMO. I really need to know how to keep the vegetables submerged is there a trick to this? Katrina, you can purchase glass or ceramic weights from Amazon that will keep your vegetables submerged. For pickles, I pack them in tight so that it’s good and stuck underneath the brine. I put on top of the cucumbers some cabbage leaves, the thick hard part. Then I put over the leaves one of those plastic cheese or yoghurt containers that will press on the leaves when the lid is screwed. Those containers also serve to receive any overflow of the pickling liquid. Instead of burping the jars I put a paper towel between the lid and the jar, it’s enough to let the CO2 out while preventing bugs from coming in. Thanks for sharing your technique, Jordi! I made home made pickles with water and salt, dill , garlic, it said to let sit for 12 hours I did ,when I was putting them in the fridge I noticed that there was bobbles are they still good? Gail, the fermentation time should be anywhere from 3-7 days depending on temperature. At 12 hours, it’s just starting to ferment and the bubbles or fizz is a good sign of anaerobic activity. Keep it going! Patty, each time you burp the jar, gasses from the fermentation process will be released. The more you burp, the less the fizz. Does that make sense? I hope that helps a little. Give the pickles a try. You’ll know when you taste them if they’re ready or not. It could be anywhere from 1-2 weeks. Do u have a recipe for anything with hot peppers? I have tons right now and no idea what to do with them. Like tons lol I see above u mention something about making hot sauce…. Alexis, I don’t have anything on the blog now but this is what I do. I gather the peppers. You can seed and de-vein them if you want. I then put them in a quart jar with nothing but filtered water and 2 tbls large granule salt. I let that ferment for at least two weeks, usually one month. After that time is up, I blend the entire contents of the jar, strain it, and have homemade hot sauce. It’s super yummy! I made a batch of hot sauce using your instructions and let it ferment for 6 weeks. My friend came and tried it, said it was really good. Much more flavor in this sauce than store bought. So now I’m making another batch with some ghost peppers. Jody, what temperature did you ferment at? With those peppers is it ok to put some minced carrot , onion , garlic , cilantro , lime juice plus some spices for a month to make hot sauce? Marilyn, I use about 1 tablespoon per quart. Lara, it’s more like a dill pickle. Definitely not sweet. Excellent. We LOVE dills, so this might work for us! Thanks! If we want sweet, do we just add sugar to the brine? Erin, this recipe isn’t for a sweet pickle. Kirsten, unfortunately, fermented pickles can’t be canned. Once they’re raised to that temperature the beneficial bacteria will die. So you would definitely need to make sure to make pickles with the right amount of vinegar to ensure their safety. This is a big reason, I make small batches. I only store about 2-3 quarts in my downstairs fridge and keep one upstairs. One thing to keep in mind is it’s a good idea to ferment with the seasons. Ferment some pickles, once those are done, move to a different vegetable that’s in season. I’d recommend Wardeh’s book from GNOWFGLINS, The Complete Idiot’s Guide to Fermentation. It’s a great resource and has many different recipes for vegetable and fruit ferments. Good luck! I’m also wondering about how long they will last after they have been fermented? They are required to be kept in the fridge, right? But for how long? 🙂 Thanks so much! Hello! Once the fermentation process is finished, do you know how long these can be stored in the fridge? I have A LOT of cucumbers and, knowing my family, they’ll devour the first few and then slow down and I’ll have some excess. Thank you! Jackie, I’ve had my pickles in the fridge for a good 6 months and I’ve had my cabbage ferments for over a year. Can I slice the pickles and ferment them and can you please describe the ideal size and look of the cucumbers for this process? Thank you! Sure Mary! I’ve made crosscut and long sliced pickled ferments and they’ve all turned out nice and crunchy. Check out my video, the fizz of fermentation. In it I have long sliced pickles. The ideal size is anywhere from 3″ – 4″. Also, remember, the fresher the better your results will be. My cucumbers ended up big at the top and pointy on bottom and very light green. Do you think they will work still? I haven’t tasted a raw one to test for bitterness, etc. I think it was lack of sun during development because something’s going on with my plant (another story) and they seem to be producing more uniform and dark now (in the small stage). Hoping for more as there are TONS of blossoms and bees out there! Allissabeth, I totally know what you’re talking about! My cucs have done that before. I’d say give them a try! You really have nothing to lose, especially if they’re bitter. I think in the fermentation process, they’ll take on more sour notes and you won’t notice that bitterness so much. Go for it! Yum, can’t wait to hit the farmer’s market this weekend to stock up on cucumbers-I am definitely going to have try this! They took some getting used to, but my hubby & kids have really gotten to like Bubbies brand fermented pickles but they are so expensive that they are reserved for special treats only…I’m sure homemade is more economical & taste better too! Steph, they taste very similar to the Bubbies. I get those on special occasions during the winter time ;D They’re so good!! Diana, in the past when I have made pickles (Canned variety) I have dropped a whole jalepeno in with the baby cukes. The longer they waited prior to eating, the warmer they got. Just a nice hint of heat to the dills, and the neighbor boy had dibs on each pepper! I’m going to give it a try I have so many pickle cukes I don’t know what to do with them all !! Do you seal these with regular ball lids and then break the seal to burp them ? Rich, they’re not sealed. I have the bands and lids on, but they are not sealed. So yeah, I just open up the lids and burp them. All I do is slice the cucs longwise, pack into the jars, add halved green tomatoes and a few long green hot Cheyenne peppers, add 1 tsp canning salt, cover with boiling water to I/4 inch from top and seal…..they will keep for a year and they do not need to be fridgerated until opened. Kathy, I love that! I’m going to give that a try! Where do you live, Kathy? I assume some place cool? How long will these keep unrefrigerated? I am limited on fridge space, but have tons and tons of cukes from the garden. Julie, traditionally large crocks of sauerkraut and pickles were kept in cold cellars or even dug underground for some time. I think if you have a nice COOL place to store them, then they can last awhile. Unfortunately, I can’t give you an exact expiration date. Debbie, burping the jar means to open up the lid to let the gasses that were created by fermentation to escape. So just open it up, the contents will fizz, and then seal it back up. Why do you burp the jar? Wouldn’t it be safer to allow the CO2 to become more concentrated? Burp the jar for safety. If too much pressure builds up from gasses, the jar can explode. Any ideas how I could imitate the seal of a Mason jar with a recycled jar? We live in China, where believe it or not, I can’t buy Mason jars. I’m constantly on the hunt for good jars, but there’s no way to get that same signature seal. I’d love some suggestions. Carey, I used to live in China and in the market you can buy pickling jars, they are wonderful! Now that I am back in in America I miss them. I made refrigerator pickles in them all the time, but the Chinese make fermented food in them and don’t refrigerate them. They are bigger than a canning jar, with an unusual opening and lid. the top looks like a bowl with a inner opening and then a lid fits on it that simply looks like and inverted bowl. Hope that helps! Thought I’d give this a try with green tomatoes. After 4 days, the garlic cloves have a green tint to them?? Since I’ve never done this before I’m very unsure of what’s normal, and what’s not. What do you think? Regina, I wouldn’t worry about that. The colors of the vegetables will usually bleed. Just make sure everything is submerged. Oh, these look like fun! I’ll have to try it with our farmers market cucumbers soon! I just tried making these today using a different recipe that says to leave the jars exposed to air instead of sealing them. Why does your recipe close the lid? I wonder what the difference is. Also, I only have little Mason jars on hand, and couldn’t pack too many in. Consequently, some spears are sticking out just a tiny bit. Will that spoil them? Why do they all have to be completely covered in water? I love the name Spain in Iowa. That would make my moniker Texas in Virginia, which is less exotic if surprisingly no less foreign! I just burped my jars today. However, one jar wasn’t super fizzy and it had a white film on it. Should I throw out the pickles? It was just one or two jars out of 17 so it wouldn’t be a terrible loss. I also tried one and it was great! Thanks. Andrea, I would skim the top and give it a good smell. From what I’ve learned from my local Weston Price Group is that if it smells okay, it usually is. Give one pickle a taste and see how it is. OMG…..I made 2 jars of these exactly 2 weeks and a 1 ago, and they’re both gone already! These are FANTASTIC!! I was a little leery about the bay leaf, but whatever it did to the pickles was wonderful! I do have a question though. How long can these sit on the shelf without refrigeration? I’m going to be making more, but I don’t want to make too many and have them spoil. Thank you so much for this recipe! That’s great, Diane! I have left them out up to a few weeks and in the fridge for a good 6 months. I just finished making my very first batch of fermented pickles, thanks to your recipe. Thank you so much for your detailed instructions. I’ve been wanting to do this for so long, and I harvested just under 3lbs of cukes this AM, so I thought I’d give it a shot. I sliced mine in half lengthwise so they’d fit better. I’m hoping they’ll stay down in the brine. One jar had a couple popping up, but I think I’ve secured them. I added one more quarter slice to that jar to keep it tighter. Alright I have a jar of these started. I’m excited to try them in two weeks! I have a concern. I began the pickling process almost two weeks ago (2 wks this Sunday). I burped them at the one week point and they were just like your video. yay! My husband and son then burped it again a few days later, and I think he said burping it more than once was good. Hm. Well, tonight I went to burp it based on that new burping information and there was no fizz or bubbling at all. I put them in the fridge immediately. Now I feel badly about the dead fermentation instead of my happy live food. Do you think these pickles are safe (one big jar) if they haven’t fizzed for possibly two days, unrefrigerated? Thank you Diana. I tasted them today and they were fine. whew! I appreciate the education and support. I’m really looking forward to trying out this recipe, as I love fermented pickles. I am wondering about how you sterile/ process / seal the jars before and after burping them? I am used to canning jam, but maybe this is not a concern here? I am concerned about spoiling. Kyla, I just make sure I wash my jars, lids, and rings in the dishwasher right before I use them. TIP: To keep your pickles crisp, some people put grape leaves in the jar with the pickles, but how many people have grape leaves lying around? It’s the tannins in the grape leaves that keep the pickles perky and crisp, so all you have to do when your adding the contents to the jar is add a tea bag (one without a metal staple) and the tannins in the tea do the same thing as the grape leaves. My pickles stay crisp this way. Hope this helps. I found grape leaves in my neighborhood (which is weird) and added one to each jar. Each leaf disintegrated into a white cloud of fluff but didn’t seem to affect anything. Pickles were crunchy!!! Best pickles I’ve made yet. I had been using a vinegar recipe until I found this one. I love the natural fermentation and they taste much better than the vinegar ones although sometimes I add a dribble of vinegar before eating if they aren’t sour enough. I wonder how long they are safe outside the fridge? I live in China and don’t have a large enough fridge. I have been thinking of leaving them on my porch for winter since it gets cold here. I’m wondering if these can be made with fresh carrot sticks or slices. I just followed the recipe and used 6 tbs. of Morton pickling salt in 1 quart of water. I consulted the Morton conversion table and the course sea salt and the pickling salt can be measured the same, but in parenthesis you then say kosher salt which is not equivalent. Which kind? I think the brine is too salty. 6 tbs. of salt seems too much for 1 quart of water. Also after pouring 1 1/3 cup of brine over the cukes in a one quart jar there was very little room to top it off with fresh water so I think the concentration is too high. I tested one cuke after four days, probably too soon, but there was no hint of sour, mostly salty. It looks good however and is bubbling at the top and is crunchy, I used a pinch of loose black tea in each jar because I could not find any oak or grape leaves to keep them crunchy. I read that the tannins help. Hi. Thanks for the great recipe. I can’t wait to try this with the cucumbers in my garden this summer. One question. Is the brine hot when you pour it into your jars or can it be cooled? Thanks. Emily, the brine is not hot. It’s pretty much at room temp. Can I use the plastic lids to cover the jars with, instead of the metal lids with bands? Oh yes, Lana. The plastic lids are just fine. Thank you, Diana! My cukes are soooo slow in the garden. Can’t wait to try this recipe. I am trying the pickle recipe and I can’t seem to keep some of the dill, pickling spice and garlic from floating to the top. Should I put something in the jar to weigh it down? Yes, I would. I usually stick a cucumber on top and smoosh it down but if you have a weight, that will work too! How do you get the cukes to stay down in the brine? I’m using pint jars and I don’t know what to put in there, other than food which will mold, to keep them down. Do you have suggestions? Thank you. I mentioned my dilemma to a friend and she said she uses rocks (which she has sterilized). What a great idea! Julie, I always add an extra pickle and smash them down so they literally are stuck beneath the brine. Hope that helps. i just opened a jar after 7 days, and there is substantial green fuzz (mold) on the pickles. is this ok? i used lots of kosher salt. ny wife says i should throw the whole thing out. Kevin, were all of your pickles submerged in brine before closing the lid? There shouldn’t be mold on the pickles but I know some skim it off and smell it before throwing the entire thing out. I think that’s a personal choice, but I’ve never had mold develop. I made my pickles last week before going on vacation – I have just returned and am burping them – one of them leaked a little (the went 8 days before burping) – can I add a little water to it? Also some of the stuff inside is floating and not submerged. If I add a slice of cucumber, it will probably be sticking out – should I just discard this piece when its finished? Tip: Place a small chunk of OAK wood on top of veggies to help assure they stay pressed down under the brine. The oak wood will also add tannin for crispness, AND adds the old fashioned “oak barrel cured” flavor. Small chunks of oak are sometimes sold in bags for use in smoking meat and BBQ. Will this recipe work for Jalapeños? I just tasted my pickles and they are delish! Thanks for the simple recipe. I know once opened, to store in the fridge, but what about the other two jars that are not opened? Do they need to be stored in the fridge as well? How long can they be stored? I plan to pickle every week now that I know how easy and tasty these are and would love to have a winters supply of pickled veggies. Thanks again! Anne, yes, once they’re fermented, store them in the fridge. I would say they keep for a good 4-5 months. Do you have to “burp” the pickles after 7 days? Or? Nancy, I would burp them after a few days and then another 2-3 days later until they’re done to your liking. Nancy, yes, you can use both. They’re both large granule. Why do I have to use ‘large grain’ salt? Why not just Morton’s sea salt (un-iodinized)? Diana what are the ratios for the items that are in the pickling spice? I’m excited about your receipe but not sure how to create the spice? Do you just try different things and come up with your own taste using those spices? Thanks! 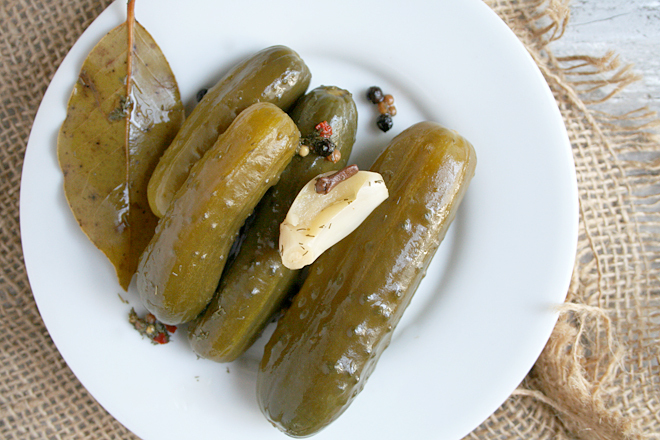 We love whole pickles for snacking as well as sliced for burgers and sandwiches. Our other favorites are green beans and asparagus with and without jalepeno added for a kick. Thanks for the recipe & the pics. I just pinned them. Hi Diana, I just started some, and put a link back to your recipe! I just tried mine and they had good color, crisp but REALLY salty, even after a good rinse. Any suggestions? Maybe I just checked them too soon? It was only 4 days. I saw some people use a “finish brine” too? Hi, these look wonderful. I’m going to make this with my little Big Sister as soon as we can get them from our farmers’ market. Would you mind sharing how you also ferment the beets? Do you use basically the same ingredients for the brine? Nancy, as long as all of your pickles were submerged you should be fine; however, if they weren’t submerged, I would hesitate after 4 days as that could introduce mold. Love brined cukes, but why do you add filtered water on top? Does this dilute the brine??? Here’s my question- I used your recipe here, and everything looks good. I burped them today, and tried 1 small piece. What I’m tasting is very heavy salt. I’m going to wait one more week, to the 2 weeks. If they are still really salty, I’ve read that if you refrigerate them that will knock down the salty flavor after the ferment? Or should I create a “finish brine”, as I’ve read they are less salty after soaking as well. Any ideas? Have you ever used that? I used a different recipe from Cultured Foods and there’s less salty flavor after 1 week. I don’t want to toss them, just thinking ahead… Thanks for your help! Sorry for the late reply, Nancy! I’ve been out with family. It may have a bit of a saltier taste before the full two weeks. Yes, once refrigerated, it does knock that flavor down. But the recipe is for 6 tablespoons salt which is divided amongst 3 quart jars. It ends up being a little less than 2 tbls per quart. Mine turned out tasty, super crunchy (I did add a grape leaf to each jar) but a bit too salty for my taste. I used Ball quart jars; when I added 1 1/3 c brine there was hardly any room left for filtered water. To reduce the salt flavor would you recommend less brine, or would reducing the amt of salt in the brine be better? I don’t want to disrupt the fermentation but would like slightly different flavor. You know Ululani, anymore, I like to add 1tbls of salt to each quart jar of whatever I’m fermenting. I only have pint jars would I have to burb them any sooner? If I decide not to use the pickling spice will that change any of the fermentation? Do you tightly seal your jars? I’ve been making them lately by leaving the top on upside down, loose, so that air can seep in, but they haven’t been turning out very good. I think you’re saying that you seal them tight, and let them burp every few days, correct? yes, i tighten them and burp them every 2-3 days. My cucumbers float. How do you keep them down so they stay covered? Well, since I can’t get a response I’m going to put them in a finish brine and see if they’re edible after that. If not, off to the compost pile. I’ve read elsewhere you can adjust the salt to taste…. I can answer a few things here. 1. The salt in this recipe seems to be a typographic error, since it is about 2-3X what most recipes call for. Try 2 Tablespoons salt per quart. 2. Keeping the cucumbers below the fluid level is done with a weighted plate or bag of water. This recipe IS 2 Tbs of salt per quart. The entire recipe makes 3 quarts, hence 6 Tbs of salt…. I highly recommend using grape leaves. Iʻd never used them before and was amazed at the difference in quality. Brine was clearer and pickles crisper. Since grapes donʻt flourish on Kauai we used commercial canned leaves – itʻs all that was available in the area. The worked, but Iʻm told not as well as fresh. I just finished the Hawaii Master Food Preservers Certification Course with Ken Love and as looking at a jar of 5 day old sauerkraut fermenting on my dresser. We used the bag of brine water technique and there is little odor escaping. No mold. I love fermentation! I made these on August 1st, burped them after a week, it is now August 16th. They are crunchy, fizzy, and great. Except a bit salty, if I let them ferment a bit longer before putting them in the fridge will the salt mellow out a bit? They do not have that fermentie odor yet. I have achieved the result in the past with kimchi, but this is my first attempt at pickles. thank you. Some of my pickling spice keeps floating to the top even though I put it in before I tightly packed the cucumbers and put the brine in. Should I just scoop them off the top or would it work if I refrigerated them? I’m brand new to fermenting and I don’t want to have to toss them if they get mold from the pickling spice floating on top. Thank you! So I just finished my first 2 weeks of the recipe and had my first taste of pickles. Yeah! They have a little fizz, and probably a little more clove than I’d plan next time, but my question is this: Do I simply leave them in the brine in the fridge or what? Yes, Phil. Leave them in the fridge in the brine. I left them in the fridge until now – almost at 3 week mark. They are a lot less salty and a little less fizzy – crispy and tasty!! Thanks for the tips. I tried this recipe with just two jars (because that’s all I had for cucumbers), and one jar looks great, but in the other one, the garlic has turned bright green. What went wrong? Copper in the water will turn the garlic green. If you use distilled water, this will not occur. But it is not harmful. How do you tell the difference between a jar of pickles that is fermenting and one that has spoiled? I’m interested in trying to make my own fermented pickles, and your method looks really simple. I really like dill pickles, but am a little picky about the taste. For just plain eating out of the jar, I prefer the “baby” pickles to the Kosher pickles, because they have a milder taste. I don’t like anything that’s spicy. Would you say these pickles are very mild, or more on the spicy side? Thanks! I think I may be asking a few silly questions here but any advice you provide would be so helpful. We have a problem with our brine solution. On our last trial we ruined a few batches of pickles (either too vinegary or too salty). I found your recipe and wanted to try this instead of using a vinegar solution. My husband and I are trying our hand at pickling in Bali and want to supply a local market. We will need to pickle 2,880 x 1L mason jars at one go (our farmer is harvesting 3,000 kgs of cucumbers at one go). The only decent salt we can get here is sea salt (not store bought but actually made in a village on the coast). 1. Could the salt be placed in the jar with the rest of the ingredients and boiled water be poured in? Is this a silly question? Does the brine need to be made first before adding to the jar? 2. Do we need to boil the solution first you think or can this be produced at room temp? 3. Is burping necessary? We make a lot so burning 2,880 jars could become time consuming. 4. Is it essential to refrigerate after producing? Again with this amount we would need a large cooling room which isnt necessarily affordable as we are a startup still. Lianne, this recipe is for a small batch. I would hate to give you advice and have something go wrong with that many jars. If I were you, I would try contacting some large producers of fermenters and ask them how they go about doing this. It’s very cool what you are doing so I wish you the best!! If my pickles are bigger can I slice them into spears? Hi there. I have these lovelies brewing away now for 3 days. I have noticed that most of the lids of the jars seem to be under pressure. Should I at some point worry about a jar shattering or should I maybe burp them sooner than a week? So I made these a week ago, I just burped the jars, and decided to try one. They are SOOOO salty I can hardly eat them. Like seawater. I followed the recipe exactly- 6 tbsp large granule sea salt per quart (not per jar) of water. I’m not sure why they came out this way. Is there anything I can do to salvage them?? Any advice would be much appreciated. Caroline, I’m a bit confused. The 6 tbls is to be dissolved in 1 quart of water. From that solution it’s to be divided into 3 quart jars. 1 1/3 cup of the solution is to be placed into 3 quart jars. So each quart jar ends up having less than 2tbls of salt. I hope that helps a bit! Diana- I did 8 jars. I just kept making more salt water until they were full…. They were not super tightly packed with cucumbers. I guess this is how they got so salty. Can I dump some of the salt water out and replace it with plain water? Or would that compromise the food safety? Caroline, It’s difficult for me to say since I’m not sure how many tablespoons of salt each jar has. One thing with natural fermented products is that they will taste saltier; however, once placed in cold storage a lot of that salt does settle and the flavor develops over time. I would say place it in the fridge and see how it tastes after a week. Aside from the salt problem- thank you for this recipe. This is my first fermented anything. I will definitely try it again. When you burp the jar does that mean it’s been opened and now needs to be refrigerated? Or can it stay on the counter? No, it can still stay on the counter. Here in Thailand I have no place for a garden so depend on the local open air markets for veggies. I have not seen any pickling cucumbers, but can buy the regular cucumber, but in small (4″-5″long) sizes. Will these work okay for pickles? Rean, yes, if there was no fizz at all, there was no anaerobic activity. Hi, some of mine don’t have as much fizz, but they taste pickled, is that still ok? Yup, it should be fine, Aria! Hi.. I found your website cause I wanted to make fermented pickles at the end of summer. Thanks so much for your recipe. They are awesome. I made a huge batch that we are still eating. They get better with age. They are the best pickles. Thanks again. Hello Diana, Love how easy and simple this recipe is. Are the jars of pickles self-sealing, and are they shelf-stable? Do you leave the jars on the counter for two weeks or in the refrigerator? Thanks I’m so excited to try it! Bethany, I leave the pickles on the counter and usually anywhere from 1-2 weeks. Really, it’s a trial and error to find out what works best for you. Also, depending on the temperature including humidity will make the fermentation time change each time. It depends on your taste, Bethany. Once the fermentation is done to your likeing, then yes, I put them in the fridge. My pickles came out good,except on the salty side. I used a teabag and my pickles were crunchy. Now I know my water to salt ration was off because I use a 2 quart size jar and also I added more salt and water to my pickles a few days later after initially doing my jar because I didn’t think I had enough. So my question is what is the best ratio to salt for a 2 quart size please. Thank you. Still need a good ratio salt to water for 1/2 gallon jar to do pickles right. Thanks. Hi, I tried the fermented pickles in a crock before and had gotten mush. I believe it was because I did not cut the blossem end off. I tried your method am at the on week point. Interestingly, I was able to use the pickling pickles from our neighborhood Supermarket as I don’t have anything in my garden yet. I burped and tried one. It was excellent. I do however have a question. Once the pickles are at the point that you like them, do you leave them in the same brine and keep them in the refrigerator? Will they keep fermenting only slower? This is what the jar I tried seems to be doing. I put them in the fridge last night and the lid seems expanded again. Hi John, sorry for the late reply! Yes, I leave the pickles in the same brine and put them in the fridge. They will continue to ferment, but as you had mentioned, much slower. I would say they keep for a good 3-6 months. Hello Diana, I tried to leave a post from my computer at work but it doesn’t get past “you’re comment is awaiting moderation “? So this is from my phone. I assume at the end of two weeks all bacteria is gone? Do I store the pickles in the same brine and how long will they keep. Can I process them (can them) to keep longer? Thanks a lot for the recipe. I’ve been trying to make pickles in a crock like my Grandmother and only ever got rotten pickles. John, you cannot process them, it will mush them. Also, the bacteria is not gone, quite the contrary. The pickles are full or beneficial bacteria. That is why you want to put them in the fridge after they have fermented to your liking, so the bacteria are slowed and your pickles remain stable. ty for this recipie i prefer the “fresh” taste over the vinegar flavor of regular processed pickles. this is my recipe and some of my experience. .hope it helps to contribute to clarification. 1/4C SEA or CANNING salt : 6C filtered water. Dill, Garlic, Bay Leaves, FRESH Grape Leaves, Cukes washed in cool water and 1/4″ cut from both ends. GRADE your cukes by size. Finger size keep hole, large cut in half lengthwise and JUMBOS slice 1/2″ thick. in a 1 gal. crock i put my spices, dill, and a few cloves of garlic (squashed) in first. then my whole cukes, 1/2 cukes, and then my slices. bring water and salt to a boil and let cool to room temp. USE CANNING or SEA salt (kosher salt [morton’s] contains anti-caking ingredients [to help maintain salt from clumping) this contributes to an “off-colour” to your water and flavor can be compromised. pack the crock tightly with cukes leaving about 2′-3″ head-space. put grape leaves on top and overlap them and tuck the edges of the leaves along the sides of the cukes in order to keep them from rising to the top of your crock. take a chopstick, or plastic knife and cut small slits/holes in the grapeleaves (DO NOT USE METALLIC OBJECTS!!). this allows air to escape when adding your brine. add your crock weights or a small dish on top of the grape leaves and then fill the crock to about 1/2″ from the top and cover crock loosely with a larger dish, cheese cloth or whatever is handy and easy to take off in order to keep things out of the crock that shouldn’t get in there. place on the counter and in a few days you will have pickles! #1. the problem with “saltiness” is dependent upon the size and slice of your cuke and how many cukes you squeeze into your crock AND the variety of cuke. if anyone knows of a recipie that uses POUNDS of cukes:CUPS of brine….PLEASE LET ME KNOW! that would probably help with allot of the “salt” problems. what makes fermentation fun and discouraging at the same time is that it is trial and error until that glorious day when you find the perfect method! #2. Depending on how warm it is in your house, fermentation may take less time or take longer- the warmer the house the faster the fermentation AND the flavor of the pickle will vary depending on this factor. #3. Garlic turning “blue-ish”? Don’t worry! Garlic may have a blue or green tint to it depending on the copper content of your water and the cukes. the garlic absorbs the copper and thusly turns blue. #4. Depending on where you live and the mold content in the air and if you have little flies/gnats (especially during the summer months) you may encounter mold and or small maggots around the top of your crock. (very gross but very natural and common). therefor, to stifle this occurance, it is necessary to check your ferment often and skim the foam from the top using ONLY NON METALLIC spoons. if you forget to skim, your food will still be safe AS LONG AS THERE IS A COUPLE INCHES OF LIQUID COVERING YOUR FERMENT. so just skim and wipe around the edges of the crock and continue with your ferment. #5. If ANY consumeable product (spices cukes/kraut) is poking out of the water…DISCARD IT IMMEDIATELY so that it doesn’t contaminate the rest of the batch. once exposed to air, things can start growing. by having a couple inches of water covering your product, it keeps the air out (and keeps the fermentation/CO2 process going.). #6. Use bleach water ONLY to clean/sanitize your crocks. REGULAR LIQUID BLEACH/CLOROX (jars are easier to rinse when using soapy water and well, crocks can be heavy and a pain to get into your sink and completely rinsed.) Bleach water, when it evaporates leaves only salt behind so after your crock has dried, take a damp towel and wipe down before storing or using again. #7. if using a variety of sizes of cukes, ALWAYS put the slices in last preceded by halves and wholes. this way you are able to “test” your ferment process easily without wasting a whole cuke. just take a slice everyday to test and curb your pickle craving. when digging for your pickle slice be careful you don’t end up floating the whole batch to the top and use only non metallic objects to pluck your pickles. Also, keep in mind, slices and halves WILL BE SALTIER than your wholes and will take less time to ferment…another reason to put them at the top of the crock. hope this has helped and hasn’t caused too much confusion. Hi Diana! Ok… so we tried the pickles today after making our very first batch ever (so exciting!) ,and I found them almost too salty to eat. Now, my cukes were a little long for the jars, so we had to do spears. Other than that I think I followed your instructions to the “T”. Did I miss something? Looking forward to trying again and fine tuning 🙂 Thanks for your help! Celina, if the pickles were too salty for you, yes, I would go back and reduce the amount. For each quart jar of any ferment that I make, I add 1 tbls of salt. Maybe start there? But yes, since the pickles were cut, they would be saltier. I am trying your recipe for the first time! So looking forward to the end result…my family loves pickles. I will let you know I make out! Hi Diana, can’t wait to get started. Is there a benefit to get pickling starters, perhaps to boost the variety of bacteria, or just standard veggies from a farmer’s market will do? I’m sorry, Gaby, I’m not sure what you mean by a pickling starter? I use veggies from the farmers market or even organic from my local grocery store. Thanks for sharing this recipe! In one of my jars, the top couple of cucumbers keep floating up out of the top of the brine. I check on them each day and poke them down, then add a little more brine. It’s been two days since I made them; today I took a couple out in hopes that they would all stay down. Will two days of floating cause the pickles to spoil? Will all the pieces be affected, or just the ones that floated up? Katie, I don’t think after two days it will be a big deal. I’ve tried the recipe today and all seems to have gone well so far except all the cucumbers are floating and I’m afraid not all are under the brine/water mix. Will these still be ok for consumption? We weren’t planning on refridgerating. Alan, they should be good as long as mold doesn’t develop on the top of the jar. That usually happens when vegetables are above the brine. Melissa, yes, I just responded to that. I wouldn’t worry. Toss the garlic, eat the pickles. Probably an older piece of garlic that was already green within. As soon as theirs pressure, burp them! The salt water should cool so it won’t kill the lacto-bacillus. Some people following this recipe might think the boiling salt water is used to sterilize the cucumbers. You want to ferment them so cool the water to luke warm before pouring over the vegetables. Actually, the lacto-bacillus bacteria, at the beginning stage, has still not developed. The reason to boil the water a bit (or bring to heat) is to dissolve the salt. Definitely allow the salt water to cool before pouring over the cucumbers. How do you make the pickling spice? Is it just equal parts of coriander, allspice, mustard seed, and whole cloves? Also, do you add 1 Tablespoon or 2 1/2 tablespoons of the allspice. The recipe differs from your follow along instructions. Thanks! Okay thank you! So do you add 2 1/2 tablespoons of the pickling spice to each jar or evenly divide the 2 1/2 tablespoon of pickling spice among the jars? Hello. I’ve been searching the web trying to find an answer and came across your site. I hope you can tell me. My aunt is making fermented pickles and veggies very similar to your recipe and her jars are making popping noises. Is that because she needs to burp them? She’s worried it’s not normal and something could be wrong but I thought it was probably the bacteria breathing and needing to be burped. What do you think? Stefanie, it sounds like that to me. If you’re making ferments that are capped, you’ll need to burp them to release the gasses. So I made three jars and let them Ferment two weeks, some of them were exposed to air and have white stuff (like a white film) , on the tips, they are all pretty soft kind of mushy. Can I just cut the white stuff off? Or are they bad now? Peggy, I’m sorry they turned out mushy for you. They should definitely be good though. My husband pickled some cucamelons using your method. After one week I opened yhem and there was some translucent slime on the top of the pickles. I kimmed it off and tried one, tasted very good. Is that slime which I assume is a type of mold dangerous, or is it safe to eat them? Thanks, I love your recipe. Bonny, is it like a white film? If so, no that’s just part of the fermentation. Should totally be fine! Do you have a recipe for naturally fermented SWEET dill pickles? If you do not, how can you sweeten up your dill pickles, like after they have fermented? I have made brined cucumbers a few time with some success. This year I used oak leaves as my grapes had a virus and had to be destroyed. This year was the best I have ever made. The pickles were crisp and tasty. I just put my first batch of these fermented pickles in my pantry. Can’t wait to see how they turn out!! Hi, I’ll try to make this. I was wondering if I can use reused jars of pickles I bought at the store? also would celtic salt be OK? thanks a lot! thanks it’s been great! can’t stop eating them! You use 6 T of sea salt in 1 qt of water? Isn’t that about 12% brine solution? Sandor Katz suggests about 3 T of salt (about 5.4%) and I find such pickles very salty . I am currently experimenting with 2.5 T per qt or about a 4% brine solution. Are you storing your pickles for significant lengths of time? I just took out my pickles after fermenting in a dark closet for two weeks (I burped them at one). They don’t appear to be fizzing at all. One of my jar had tiny bubbles when I went to burp it, but now has none. I am not sure where I went wrong. Should I wait longer for the fermentation to take hold or should I toss them? They smell fantastic. Hi, I’ve followed your recipe but used fresh cucumbers instead. The jar is on day 11 of fermentation. The brine’s gone cloudy and there’s a slight scum on the surface of the brine that’s white. The smell is just like pickled gherkins, so I hope that’s a good sign. Would you advise me on why the brine’s gone cloudy and what the white scum is? At what point can I start to consume the contents of the jar? I’m rather scared of consuming this until I know what’s going on in that jar! Helen, that’s absolutely normal. The brine will go cloudy and you’ll start to see a whitish film. It’s the good bacteria! You can can fermented pickles…..the National Center for Home Food Preservation is the BIBLE for all things safely preserved. You can can them; however, you will be killing the lactic-acid bacteria losing all or most of its health benefits. Hi Diana, (and all) We are on our 4th or 5th batch of pickles using this recipe – over a 2 year period. This fall, only got us about 6 jars of pickles, which will be all eaten in 2 months. There is no local cucumbers available. No Farmer’s Markets with vegetables. My question is, would this fermenting work with store bought cucumbers – where we don’t know what is in them? Thinking long english cukes. Thanks, Dea! You know, I’ve never fermented with store bought cucs, just because I can’t tell how old they are. It’s worth a shot! I’d make sure though, that they’re organic and not waxed. Is there a point when I have to throw the pickles out? I’ve been pickling various veggies now, most are great, but, am wondering if how do I know when they are bad? thanks a lot! Thank you for the recipe. Two questions if you have time to answer, some recipes I see say to leave the lid off covered with a coffee filter to ferment. The first and only successful jar of fermented pickles I did this way. Second is it necessary to heat the water to add the salt? Recipes I have seen and used in the past say to use cold water and chill your pickles to add crunch. Does the hot water not take the crunch from the pickles? I’m hoping you can explain the difference between leaving the lid off covered with a filter and lid on tight and the use of the hot water. Also is dried dill suitable or does it not give the same results? Thank you in advance for any information. Holly, I’ve always made mine covered. If you’ve had success fermenting uncovered, I’d say continue with that. As far as the warm water, it’s just to dissolve the salt. I wouldn’t add the cucs until the water came to room temp. Yes, I’ve used dried dill many times with great success! what if your pickles never form any “scum”; are they ok? I used distilled water, pickling salt and washed the cucumbers before adding them. It should form a white scum floating on the bottom, for sure. Does it smell sour? Thanks for this informative post. I’m hoping that eating healthy, fresh, home-prepared ferments will help me rebuild my gut bacteria after taking antibiotics. Can’t wait to give it a try! I’m new to fermentation. I’m made two batches of sauerkraut. Can’t wait to try these cucumbers. Thanks for sharing. Made some of these last weekend – they are ready to eat – the best pickles ever! Thanks for the recipe!!! I’m glad to hear that, Lana! Are my pickles bad? The brine has grown mold! It’s only been 2 1/2 weeks. If it has mold, then yes. Toss it. I have made your pickles a number of times with great success & bought some kirbys at the Farmer’s Market to make a new batch. However, we’re having a pretty intense heat wave right now & finding a dark, cool place in my kitchen is an exercise in futility! If such a place were available, I’d be in there myself! Anyway, since the recipe calls for leaving the pickles in a cool, dark place to ferment, could I just put them in the fridge to ferment? Or would that be too cold? It would be too cold. I’d just leave it in the coolest area that you can find and check them after a week. With warmer temps, they’ll ferment quicker. This recipes look so appetizing. I have tried to do some since I were a little girl by myself with my mother’s help. She also have ever cultivated fresh cucumbers in a pretty small garden. The first time I have done it was before the New Year’s Eve several days with the aim that made my mother surprised. I suggest that you use baby cucumbers to make pickles. They shouldn’t be cut out or pared, thus they will not lose the true taste of cucumbers anymore. If put cleaved carrots alternately with cucumbers, your pickle jar of will be more colorful and attractive. I had 6 pounds of cucumbers from the garden. In a crock, My husband sliced them, and I put them in a brine, with garlic, grape leaves, mustard seed, and dill. After a week. they were ready, and I put them into jars. Since I didn’t want them to keep fermenting, I threw the liquid away. I checked all resources I had and nobody knew, so I threw it out.Then I put the jars into the fridge. Then my husband, decided to fill them all with water and vinegar, and put all but one into the freezer. Now the jar in the fridge has mushy cucumbers, although he says they were mushy before he did that. I disagree. Anyway, what is the consequence of putting vinegar on fermented cucumbers? Hello do you leave the jars closed for fermentation or not? Julie, you can cover or just put a cloth on top of the jar and let the fermentation process happen that way. Traditionally, soured vegetables were made in large crocks without a lid. I enjoyed reading your recipe and would be trying it out. But what is the difference between your recipe and the recipe for fermented cucumbers sold in tins in supermarkets? And do you know all the things they put in to ferment those cucumbers? Otherwise thanks alot for sharing and for giving all the details. Do you have recipe articles ? i would like to read them too. Ronnie, tins or jars? The jars on the shelves should be fermented in the same way. My cucumbers after 20 days in the brine came out perfect, nice and firm, , I would like to take them out of the brine, to avoid them getting soft and lose their crunch, do I place them in jars with water , or whatever process to use, I cannot remember what my mom did when she made them in a wooden barrel, with great success, ( I was just 10 or 12 years of age ) that was 80 years ago. Hey Stanley. I wouldn’t remove them from the brine or you’ll lose all of that beneficial bacteria. In order to slow the fermentation process and keep the crispness for awhile, you’re going to want to move them somewhere cool. I put my pickles in a fridge once done and they keep for a good 3-6 months. 6 months is pushing it 😉 Hope that helps! We live in a semi desert area and all our spices and vegetables are basically imported. Now I can’t find dill anywhere! Will they still taste well without it? Can you find dry dill? I’m afraid it will need some sort of dill for that dill pickle flavor. I know this article is a little old, and this comment is a bit off-topic, I have had amazing success keeping my cucumbers in the fridge in an airtight plastic container with a tiny bit of water. You could probably use glass if you don’t like plastic. I am new to fermenting. I am so excited to try these!!! I am going to try your recipe soon. But can you please explain as to what you mean by making sure to “burp the jars” after 7 days? Burping means to open the lid to release the gasses inside. I’d burp after a couple days. I live in Southern California and it is 75 to 80 degrees everyday. I really do not have a “cool” spot in my house for storing while fermenting. Any suggestions? Should I put them in a cooler with some ice? Also, I just picked my cucumbers yesterday and did not have time to process all of them. Is it best to store them on the counter or in the refrigerator before I process them by them? I will process them either tonight or tomorrow. Thanks for your help! I would store them in the refrigerator to keep them crisp! Try to keep it in the cooler area of your house and know that your fermentation time will be much sooner. So check on them after a few days and see how they taste. I’m 77 and only just started trying fermentation. Due to food sensitivities, buying “off the shelf” is no longer an easy thing for me to do. Sooooo, I was given some fresh cucumbers, found your recipe, and fermented them. OMG!! They’re wonderful. Just finished eating my first one and now I’m afraid I’ll be overeating them. Crunchy and soooo tasty. (I did have to substitute dried dill…no fresh on hand.) Thank you for this terrific and easy recipe. I just came across this recipe and I have never pickled before. I am curious about the pickling spice mix. Do you make your own? If so, what are the ratios of each ingredient you use? Sanela, I buy a pre-made pickling spice from Frontier Coop. You can find many recipes online though! We made our first “Bubbies-like” pickles and they are now a necessity with every meal in our house! I found your site on a quest to find information about storage. We made our wondrous pickles 8 weeks ago. We made so many that they didn’t all fit in the refrigerator and we have been harvesting from a large jar that has been kept at room temperature the entire time. They still taste great, but they are not still producing bubbles so I’ve begun to have concern for food safety. I plan to put them in the fridge, but my question is how can I tell if they are still safe to eat? Dawn, I’m a bit confused. Did you allow them to ferment before starting to eat them? Hello, I’m late on commenting..However, I tried reading through the comments and couldn’t find this info: If the liquid gets cloudy, after you’re done fermenting, do you replace the liquid and with what? Also, how long would the pickles last after the fermenting is completed? Assuming you refrigerate it. Tanya, the liquid should be cloudy. Do not replace it as all the beneficial bacteria is in the brine as well. If refrigerated it should last a good 6+ months. In the blog post you say that the pickles have antibiotic properties. I think you mean probiotic properties. I look forward to fermenting some carrots. I made these pickles, but they were so extremely salty, we couldn’t eat them; 1 tablespoon salt for each quart seems like a lot. I don’t know what was wrong, but it was almost like eating pure salt. What type of salt did you use? Regular table salt or coarse, granule salt? I followed your recipe, but my pickles were so salty we couldn’t eat them. Did I misunderstand, or are there 2 tablespoons of salt in each quart jar? 2 tablespoons of large granule salt. So, the thicker coarse salt. I’m wondering what type of salt you used.